If a wearable drone that launches from your wrist sounds like mad voodoo technology from the future, think again. 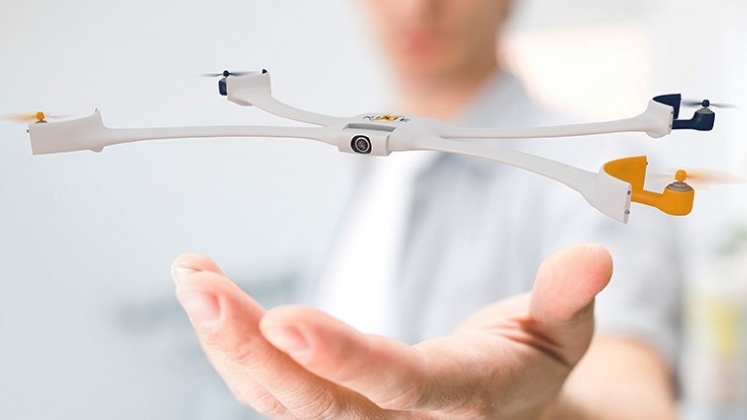 Nixie is a wrist-mounted drone that’s designed to fly off to do your bidding, be it to attack your enemies, fetch coffee…or just take selfies. Actually, at the moment it’s just the last one, with Nixie designed to take off and snap action shots from above before returning to your wrist. It’s great for when you’re scaling dangerous cliff faces or rowing through treacherous waters – as the video below shows – but probably a little overkill for lazy Sunday afternoons in the park. Nixie isn’t going to be on this Christmas’ shopping list and is simply a concept at this stage. It’s part of Intel’s Make It Wearable prize, where finalists receive $50,000 funding to create amazing new wearable concepts, to compete for an eventual $500,000 grand prize. The prototype looks like it could break at a moment’s notice, and resembles more a school science project than the next big wearable. However, as it’s been dreamed up by Christoph Kohstall, a Stanford University physics researcher, it’s sort of the daddy of all school science projects. Wareable will be at the Intel Maker Faire in Rome this week to get up close with more wearable projects.